The boys volleyball hot streak continued last week as the Eagles defeated Eastside College Prep and Santa Clara, each in three games. Over the weekend, the Eagles went 4-2 in the Harbor High Tournament, taking the silver division championship. They are now 15-11 on the season and still undefeated in league. This Wednesday is Senior Night as the Eagles face King’s Academy at Blackford at 5:45 p.m. to determine the league champion! Seniors Karen Tu, Grace Guan, Angela Huang, Justan Su and Philip Krause were honored at their final home meet last week as the swim team took on King’s Academy. Alex Yu, grade 9, took first in the 500 free and qualified for CCS. The 200m relay team of Guan, Huang, Taylor Kohlmann, grade 10, and Vivian Wang, grade 10, also qualified for CCS with their first place time. Other event winners included Guan in the 100 fly, 100 back and 400 free relay, Huang in the 100 free and 400 free relay, Ihita Mandal, grade 9, in the 500 free, and 400 free relay, Kohlmann in the 400 free relay, and Angela Li, grade 9, in the 400 free relay. The Eagles travel to Sacred heart Prep for the WBAL trials this Friday and Saturday. After a 7-0 loss to undefeated Menlo early last week, the boys tennis team headed into the WBAL tournament looking to regain some momentum heading into CCS. The Eagles did just that, as six of the seven Harker participants advanced to the round of 16. Also showing well at the tournament was the doubles team of Randy Zhao, grade 10, and Anjay Saklecha, grade 9, who eventually ended with a third place finish. The Eagles now await their seeding fate as CCS begins later this week. On Tuesday the Eagles travel to Mercy Burlingame and are home on Friday versus King’s Academy for Senior Day. The baseball team picked up two wins against Westmoor last week. In a 10-4 victory early in the week, Dominic Cea, grade 10, had three hits and two RBIs. Later in the week, the Eagles defeated the Rams 12-6. Tanay Kamat, grade 10, and Miles DeWitt, grade 12, each drove in two runs, and Nate Kelly, grade 10, added three hits. The Eagles host Pinewood on Tuesday a 4 p.m., and then travel to Pinewood on Thursday and Menlo on Friday. It was another big day for the Harker track and field team last week, as 25 season bests were produced at the meet at King’s Academy. Anthony Contreras, grade 10, continued his impressive season as he won the 200m and 400m and anchored the winning 1600m relay. Demonte Aleem, grade 9, took first in the shot put with a throw of 41’0”. Kevin Wang and Jason Lee, both grade 12, took second and fourth, respectively, in the shot put. Wang also placed second in the discus, with Jonathan Hochberg, grade 12, placing third. Finishing fourth in their respective races were Gloria Guo, grade 10, in the 800m, Sara Min, grade 9, in the girls 200m, and Bill Liang, grade 11, in the boys 200m. Jonathan Dai, grade 12 , sprinted to a third place finish in the 100. Finally, Arthur Ye, grade 12, and Davis Howard, grade 11, took first and second in the JV shot put. 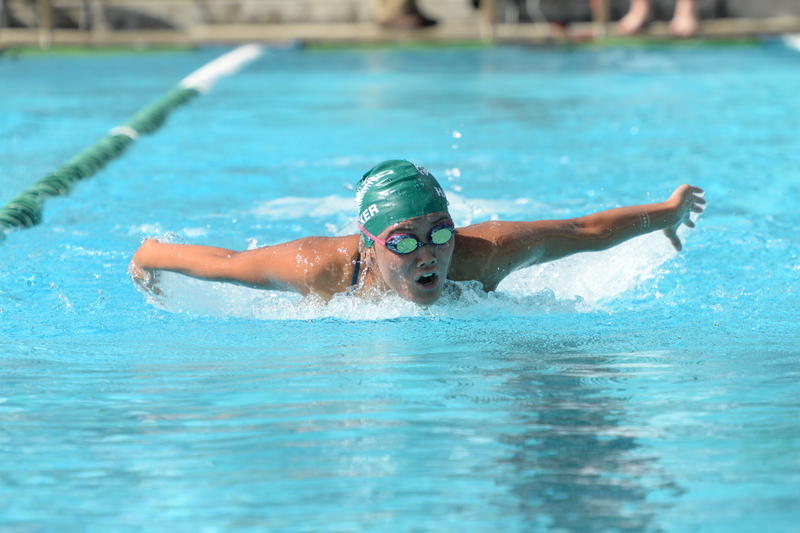 This weekend, the Eagles travel to Palo Alto high school for the WBAL League Championships. Last week the boys golf team picked up a win by forefeit, but still enjoyed Senior Day as Dakota McNealy and Zarek Drozda, both grade 12, were honored. The Eagles travel to Half Moon Bay today to defend their league title, followed by the start of CCS next week. The girls lacrosse team dropped a 12-9 matchup with Mercy Burlingame and an 11-10 game against Carlmont last week. In the tight matchup with Carlmont, the Eagles fell in the final minute, but Elise Mayer, grade 9, scored 5 goals in the loss. This week, the Eagles host Aragon on Wednesday and travel to Woodside on Friday.